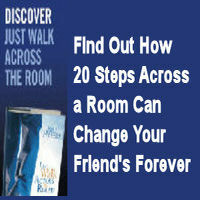 Discover how 20 steps across a room can change your friend's forever. Pointing people to faith is something all of us can do--and it shows up on the heels of a simple walk across the room. The Greatest Gift you ever received is salvation provided by Jesus Christ death and resurrection. Find out how to share with others how they can receive the Gift of eternal life.